Ahh yes, now we are well and truly into December, and those good folks living on Franklin Rd have once again embraced the spirit of Christmas. Last night we waited until it was dark (and well past Kien's bedtime), and walked up the street to Franklin Rd. I love the effort that is put in for us Aucklanders to enjoy. Santa's vehicle - full of wrapped presents. So cool! Maybe this weekend we'll go and splurge out on lights to deck out our balcony. The inspiration is there! 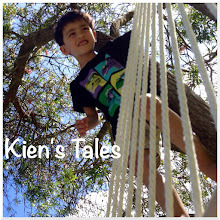 Great photos Lien, love the one with Jeff and Kien in the archway.